Marine Corps Challenge Coins are rising fast in popularity! The available custom options are key in making these coins stand out. Some of the most interesting and original Challenge Coins that you’ll see are from the Marines. 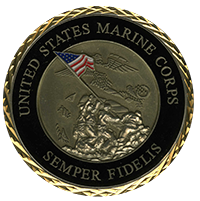 We work to make custom USMC coins that will stand out proudly, demanding attention. Doesn’t your coin deserve that? You bet it does! The Marines are a tough, proud bunch. We know this and feel that they deserve a challenge coin that befitting that personality. 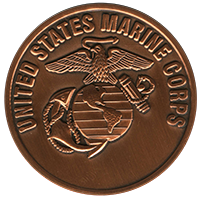 We understand how significant it can be for a Marine to have a custom Marine Corps challenge coin. Though most challenge coins are small enough to fit comfortably in one’s pocket, the stories they tell are vast and legendary. By customizing your coins down to the smallest detail, we help ensure that you receive a coin that truly embodies a Marine’s Spirit, service and achievement. Your coins will command the attention and respect befitting a proud bearer of the EGA. Our custom USMC coins also offer a way for service members to share their achievements with younger generations. Like scars, each one tells a different, significant story about its bearer. Coins will last for generations, and the personal touches can provide a learning experience for the family members of those who see your Marine Corps challenge coins. We know the sacrifices that service men and women make and are honored to help commemorate them.